Kawau was named after the Kawau Paka; the white throated or little shag-cormorant which breeds on the Island. Kawau Island is one of the largest islands in the Hauraki Gulf and is rich in history. Evidence of the early occupation of Kawau Island showed that the sea-faring tribes of the Ngatitai and Ngatiwai had occupied the island and possibly from the first migration to New Zealand. Due to the Island’s location and good strategic position for viewing any passing vessels it was a perfect place for tribes to have control of the surrounding area. Unfortunately, the tribes that occupied Kawau were notorious for their piracy and cannibalism. It was so bad that tribes from the mainland combined forces and attacked the Kawau tribes, ending their control of the island. It is said that the result of this attack ended in a cannibalistic feast in Bostaquet Bay (then known as Bosanquet) on KawauIsland, the discovery of human bones in this area confirming the stories told of this time. 1832 was the last known battle on Kawau when a Ngapuhi war party was tracked down and slaughtered. The island was eventually abandoned by maori in the 1820s after a particularly bloody skirmish during the musket wars. In the latter part of 1831 a vessel named ‘Sucidan’, sailing from Sydney to New Zealand, visited Kawau Island on its travels hoping to trade with the local natives, but found no inhabitants. While on his continued travels one of the owners of the ‘Sucidan’, Mr Wheelan, came across a group of Maoris claiming to have the power to dispose of the island. Eventually Mr Wheelan became the owner of Kawau in exchange for two or three muskets and gunpowder, although from this time there was no known deed of ownership. A manganese mine was established on the island in the 1840s; shortly after, copper was discovered by accident. Fascinating ruins of the underground seashore copper mine, a pumping engine house and a small smelter remain today. In 1841 James Forbes Beattie, acting for the British Loan and Investment Company, hired a Mr Henry Taylor to help purchase Maori land as an investment in New Zealand. Kawau Island was acquired with the intention of developing the potential it had for agriculture and grazing. So, it was first developed as a farming settlement, with the Company bringing over cattle, sheep, donkeys and farming implements. It is interesting to note that the donkeys were the first ever to arrive in New Zealand. In 1844 the discovery of copper was made by Alexander Kinghorn and his miners, who at the time were mining for manganese ore on Great Barrier Island. The British company that owned Kawau decided to form a subsidiary company called the Kawau Company, especially formed to run the mining operations on Kawau Island. Later, in 1855 the Company sold the Island to Hugh Mackay and Edward Spence after all mining operations on Kawau stopped.In 1858 on MacKay’s death the island was sold to James W. Buckland and in 1862 Sir George Grey bought Kawau Island. In 1862 the Island was purchased by one of New Zealand’s first governors, Sir George Grey, as a private owner. He employed architects to significantly extend the mine manager’s house to create his stately home in Mansion House Bay, now fully restored, in its sheltered sunny cove. In the valley behind Mansion House, the Governor created an extensive garden containing plants and animals from all over the world. 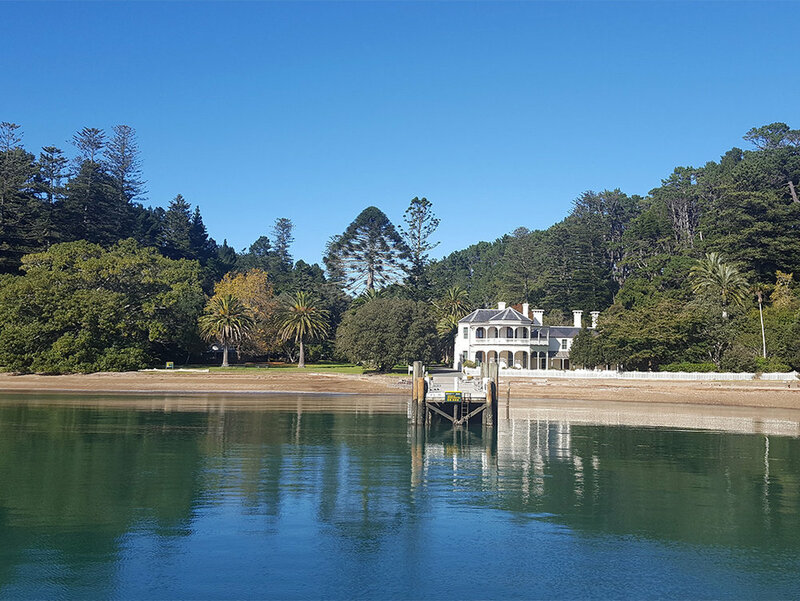 The Kawau Island Historic Reserve was created to protect Sir George’s historic home, which is open for viewing. 1867 Governer Grey was relieved of his governorship and in 1868 he returned to England for a visit, so leased the island to James Hott for a period of five years. Grey returned to Kawau at the end of 1870. Eliza and James Thomson of Australia bought Kawau Island in 1888 from Sir George Grey for £12,000. Other owners up to 1904 were Mrs Fanny Buxton, Colonel Holgate, Messrs Ross, Moore and Snowball. 1906 Andrew Farmer, a former Mayor of Te Aroha, was the last to own the island as a whole. He commenced with the subdivision of Kawau in 1912. Of Canadian parents who brought him to New Zealand as a small child, he was a speculator and businessman. Prominent in public life, Andrew was a well-known figure. Reputedly he paid £9,500 for Kawau and planned to develop the island as a resort, turning the ‘big house’ and grounds into a holiday complex. Looking from the water to the left of the jetty, Andrew built a large two-storey, thirty-bedroom guest house. Electricity was generated for the complex and a 111′ steamer, the ‘Daphne’ (named after his daughter) was built for Andrew, to be used to service the Mansion House from Auckland. He didn’t stint on advertising and Kawau continued to be a mecca for boaties and all walks of the public alike. Although Andrew Farmer sold 3000 acres to a Mr McDonald and did sell off other pieces of land, the whole venture was not financially successful for him, and by 1922 he had declared himself bankrupt. The ‘Daphne’ was sold to the Northern Steamship Co and after selling his remaining interests in Kawau he moved to Sydney. 1923 Lawford Godfrey Reeves bought Mansion House and 106 acres. Unfortunately, by this time Mansion house was in such a state of disrepair that Reeves decided to spend more money to restore and improve it. It wasn’t until May 1924 that Reeves and his family moved in and ran it as a guesthouse. In May 1945 Mansion House was sold to a syndicate, but Reeves continued to live there until his illness and subsequent death in Feb 1947, in 1959 Alan Horsfall bought Mansion House and in 1967 Mansion House was bought by the Crown and run by Hauraki Maritime Park Board. Many changes were made: the Elephant House (outside bar) a swimming pool and upgraded dining room were all part of what became a licensed hotel leased firstly by a syndicate and then by Dominion Breweries. Behind the House was a small store and post office, groups of flats, staff accommodation and further in was a camping ground. When the Breweries prematurely relinquished their lease in 1977, the Hauraki Maritime Park Board released its plans for future development of Mansion House and the park. The work needed proved to be extensive and expensive. The Elephant House, swimming pool, dining room extension, flats, cottages and camping ground were all removed. The bay was dredged, removing copious quantities of compacted cans and bottles. Towards the end of 1979 the Mansion House, almost completed, emerged after two years, to be opened by the then Governor General Sir Keith Holyoake to the visiting public. The year of 1999 was a year of “facelift” for the House and an upgrading of the jetty. It is now administered, along with sundry small areas in other parts of the island, by the Department of Conservation. Peaceful walking tracks lead through native forest to beaches, Maori Pa sites and old copper mine. Another walk takes you to a grove of large redwood trees. The magnificent house and park-like gardens are open to visitors, and colourful peacocks still strut the lawns.